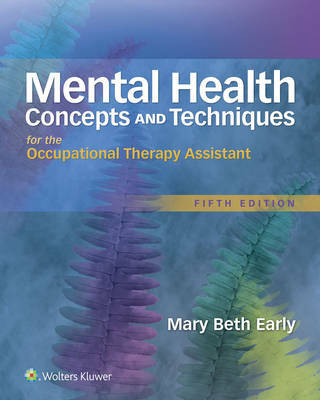 This updated 5th Edition of Mary Beth Earlys best-seller remains the only resource specifically developed to prepare occupational therapy assistant students to work effectively with clients with mental health issues across all practice settings. Filled with up-to-date, evidence-based practice information and examples of contemporary interventions, Mental Health Concepts and Techniques for the Occupational Therapy Assistant helps students develop a sound foundation in occupational therapy processes and illustrates how to intervene effectively to meet the needs of clients with mental health issues. The 5th Edition reflects the latest professional standards and recent developments in the field and includes new content, new pedagogy, and new online resources to save instructors time and help students succeed. Features: - An increased emphasis on choosing and implementing real-life activities to improve occupational performance prepares students for practice in clinical and community settings. - Alignment with the American Occupational Therapy Association's Standards for an Accredited Educational Programfor the Occupational Therapy Assistant ensures that students are fully prepared for their future careers. - A new focus on evidence-based content helps students understand how research informs practice. - New content on the recovery movement and the how-tos of addressing sensory processing and emotional regulation issues expand the students knowledge base. - Revised coverage reflects the newly released Third Edition of the Occupational Therapy Practice Framework. - Updatedcontentin every chapter aligns with the Diagnostic and Statistical Manual of Mental Disorders (DSM-5). - New Reflective Questions encourage critical thinking and showcase the connection of theory to practice. - Case Examples bring concepts to life and provide a bridge from theory to practice. - Point-of-View boxes offer differing perspectives on key topics. - Chapter Objectives show students what they should know by the time they have finished the chapter. - Chapter-opening quotes engage students and encourage them to reflect on what they are learning. - Concept Summary and Vocabulary Review boxes reinforce chapter content. - Chapter Review Questions and Activities test comprehension and allow students to assess their level of understanding. - Numerous illustrations, tables, and boxes throughout the book highlight key information. - A list of common abbreviations helps students learn the vocabulary of medicine, psychiatry, and occupational therapy. - References & Suggested Readings take students beyond the book to explore topics of interest. - A new Student Quiz Bank and new Instructor Test Generator save instructors time and help students master concepts.